An exciting hardy Hydrangea from Holland, 'Limelight' has unique bright chartreuse blooms in mid-summer that hold bright and refreshing color right into autumn when the blooms change color to a rich deep pink. The autumn display of chartreuse and pink blooms on the same plant is breathtaking! The color makes a great addition to the garden and it blends wonderfully with all other colors. Use 'Limelight', either fresh or dried, in bouquets to make a unique floral design. This is an easy to grow plant with reliable flowering and flower color regardless of soil pH. 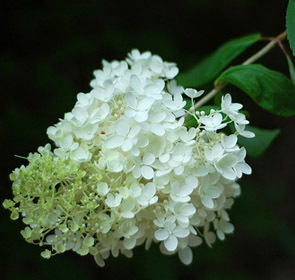 The flower heads are of good size, ranging from 6 to 12 inches and are held upright on the shrub. The blooms are well distributed making a very nice plant and display. Please select a size and add to cart. You can adjust the number desired in the cart.